We continue our countdown to San Diego Comic-Con 2015 by talking about a big part of the show, in my opinion, the artists! Comics wouldn’t be what they are without the talented visual artistry of these individuals who bring countless stories to life. They create these elaborate worlds where we can live in, interact with the characters, and see how the stories play out, albeit in the pages of the comics we read. 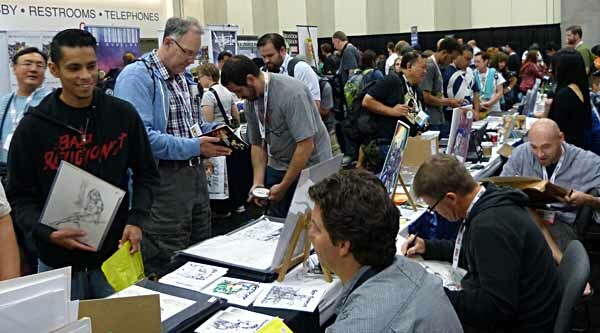 And, San Diego Comic-Con bolsters tables after tables of these skilled artisans, creating sketches, signing autographs, and selling art fit for framing. The key is to know who is going to have a table at Artist Alley. Some big names like Francis Manapul, previous writer/artist on The Flash, Joe Benitez, known for his latest creation, Lady Mechanika, and Stanley Lau aka Artgerm, known for being an awesome digital artist, have had tables in Artist Alley in years past. Artists like Stanley Lau typically will cap the number of prints he sells per customer and you can bet your bottom dollar that certain characters will sell out each day (he allocates a certain number of character prints per day in order to give patrons a chance to purchase the character they want). So if you really want to get certain prints from a certain artist, you may want to dedicate visiting them first thing! I typically follow my favorites artists via Facebook, Twitter, and Instagram, and they typically will have a nifty advertisement of what they are selling at SDCC. I know that helps me decide on hitting up Artgerm before others if there’s a character print or art book that I want to pick up. You can check out the list of artist who will be at Artist Alley here. If you are set on getting a commission from an artist from SDCC, Artist Alley is a great place to do so. Again, there are so many artists here that you can choose from and what’s nice is that they probably will have examples of their work to sway your decision. The rule of thumb here is to try to get on their commission list early because more often than not, spots will fill up quickly for the day. There’s an artist that I follow on Instagram from the UK that opened up his commission list early before SDCC and I jumped at the chance to get on his list. And, artists will have different tiers for commissions from just sketches to inked pieces or multiple characters, etc. So the skies are limitless, depending on how much that money is burning a hole in your pocket! Like I mentioned before, I typically walk Artist Alley looking for the art to grab my attention. What’s cool about Artist Alley is that the possibility of discovering new art is very high. Most of the artists have done some comic work in the past and learning about them makes Artist Alley a treasure trove. I was perusing an artist’s table a few years ago at SDCC and really liked his art. 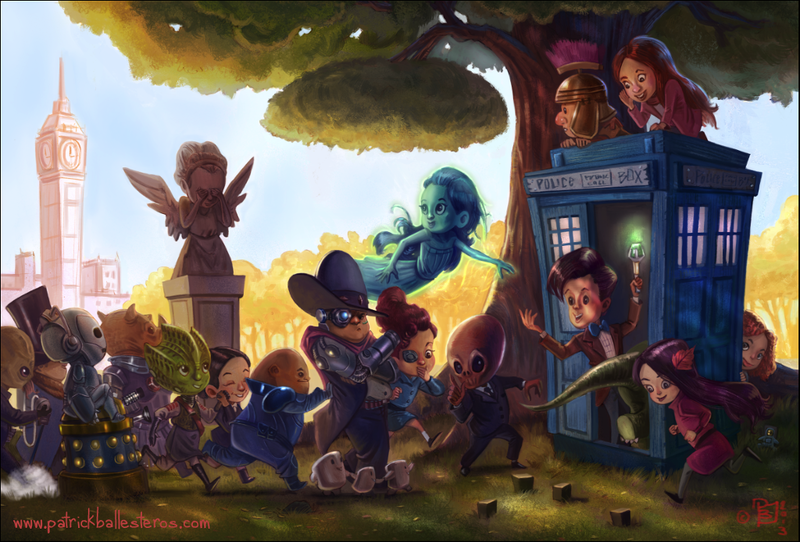 Patrick Ballesteros’ style focused on my favorite geek characters but as children. His table had a ton of prints on display but the one that I eventually purchased was hidden in a stack of his prints: characters from Matt Smith’s Doctor Who run. Today, this print is framed in my son’s room. Thumbing through artist’s portfolio book as well as checking out what they offer to sell is like getting suggestions on what comics to check out from your local comic shop. And most likely if you enjoy the art, the other stuff they’ve done (or will do) will be something you’ll enjoy as well. 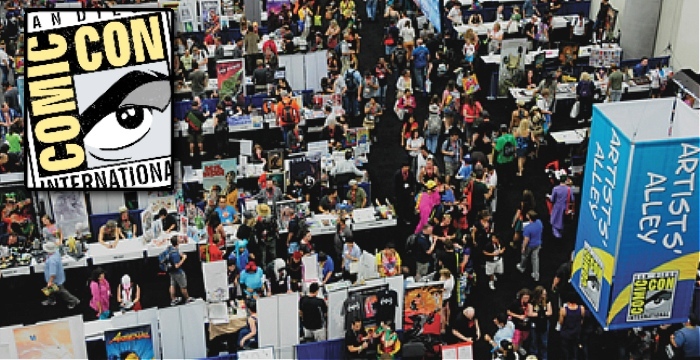 Artist Alley has been a staple of comic book conventions for a long time and SDCC is no exception. And, you get a chance to chat with the artist as well. When I volunteered at the first Image Comic’s Expo in 2013. I was able to chat with a production manager who worked on Robert Kirkman’s The Walking Dead. Yes, I know this anecdote isn’t an SDCC experience but at this Artist Alley, I chatted with him about his work with Kirkman along with the stuff he was currently working on as a side project with his artist buddy. Their art was really cool and I’ve been following them since. Those relationships you make with artists are what makes being a comic fan memorable because you can actually talk to these industry titans in-person. Granted some are more difficult to get in-front of but when you can have a Twitter conversation with one of your favorite artist, it’s priceless. Shout out to Josh Howard of Dead@17 fame. I visit his table every year at SDCC to say hi and pick up something new and I feel I’ve praised him for his awesome work and characters every time. I hope this little rundown of Artist Alley entices you to spend some time in that area of the convention floor. Like I mentioned before, SDCC boasts a ton of great artists and you can find a lot of them at Artist Alley. If you’re like me, you like to window shop a bit before making a decision to purchase or get a commission. But take it from me, you don’t want to wait too long! Leaving SDCC without that character print that you really wanted or not being able to get on an artist’s commission list is not the greatest feeling. So take my advice from above, and above all, support the comic artists out there!